Not that I didn’t love it. I really did. I could babble for hours about it and go into an in-depth analysis and whatnot but we all know that it would bore you, no? The episode begins with a dude spinning in a meadow, bird chirping, the sun is shining and the dude is apparently full of drugs 😛 Turns out that he was kissed by someone wearing halluciogenic lipstick (where can I get one? :D) and we’re informed that she is here. The she in question, wears a killer pair of red heels and is none else than River Song! Next we see Amy and the Doctor in a museum (The Delirium Archive) thing where the Doctor whines about stuff being wrong and Amy whines about wanting to visit a planet. The Doctor is claiming ownership on other things until they come upon a box that has ancient high Gallifreyan all over it. As the Doctor says “There were days, there were many days, these words could burn stars and raise up empires and topple Gods. “ Those words are “Hello Sweety” ROFLMAO Typical River, what was it last time? Message on the psychic paper signed xoxo if I recal correctly XD Anyway, the Doctor steals the box and plays the security recording in it that shows what happened on that ship. Basically River is toying with some soldiers who are about to execute her and sends coordinates to the Doctor, 12.000 years later so as to go and pick her up. She then blasts the ship door open and noone can deny that this woman might not be all doll-pretty but sure has buckets of style. Sure enough the TARDIS materialises and the Doctor welcomes her with open arms. Quite literally. Then at her command he follows the ship River was on. River sure knows her way round the TARDIS, makes herself comfy by removing her heels and hanging them on the control screens and gives the Doctor some important flying lessons that leave Amy highly amused. They end up in Alfava Metraxis, the 7th planet of the Dundra System and see that the ship ( The Byzantium) has crashed on an Aplan Temple on top of a massive mausoleum (The Byzantium Crash was mentioned by River in Silence in the library). Then River asks the Doctor to sonic her so as to make her mobile a beacon for her team to home to. The team arrives and it turns out it’s a bunch of troops who aren’t troops but clerics. It’s the 51st century and the Church has apparently moved on. Their leader, Father Octavian asks if they know what they’re up against to and River drops the bomb. It’s a Wheeping Angel. 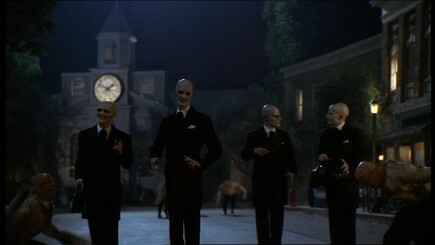 Remember those creepy frakers from Blink? Yes. The very same. Only harder, better, faster, stronger. The clerics work out they should bomb their way in the mausoleum to make their way up to the ship and while they’re at it, River shows the Doctor a book on the Angels and asks him how early they are on his timeline and he says it’s way too early. Amy, disappointed that noone wanted her help for anything goes to see the angel video again. She seems a bit mesmerised by it and suddenly notices that the Angel has moved. The Doctor wonders why there aren’t any pictures in the book and come upon a very disturbing passage: ‘That which holds the image of an angel becomes itself an angel.’ I mean it hardly gets any creepier than that right *shudder* Sure enough the angel on the video starts coming out of the screen and into the room Amy is in. Freaked, she tries to get out but everything has locked, the Doctor can’t sonic it open and panicking starts telling her not to blink, not to look it in the eyes and the thing he found out about the angel’s image. Amy proves what a smart cookie she is by pausing the tape on a blip. Everything flungs open just in time for the explosion that opens the way into the mausoleum. Before they proceed to search for the loose Angel, Father Octavian pulls River on the side and asks her if the Doctor knows what and who she is. River says it’s too early for him with a sad look on her face. When Father Octavian warns her not to let the Doctor figure it out or he wouldn’t help them she wears a look of disgust and tells him she doesn’t wanna go back to prison D: I must admit I took it completely wrong the first time I watched it and thought River was a villain but upon rewatch I noticed the looks on River’s face and now I am convinced she is probably blackmailed by the Church and her only deal out is to lend them the Doctor. Two clerics, Angelo and Christian are investigating when stone rumbles and Christian tells Angelo that he has to come and see what he found. Angelo is looking for him and we see the Angel inbetween the shadows. The Doctor hears gunfire and runs towards it. Turns out a spooked cleric, Bob, went amok on a decorative statue because he thought it look at him. The Bishop starts to reprimand him but the Doctor jumps in, in his defense and says that whoever isn’t scared is a moron. The Doctor declares something’s wrong but he can’t quite put his finger on it. There’s some funny banter about the builders of the temple, the Aplans, who had two heads and tendencies for self marriage (on which laws were made afterwards). Suddenly, the Doctor and River realise what was eating them. The Aplans had two heads so why the statues only have one? Are you guys spooked yet? Cause this really made me froze in horror. Yep, the whole fraking lot of the six floor mausoleum statues are all Wheeping Angels. Yep. I’m going to need a moment with kittens and sunshine to recover. The Clerics and River find the Byzantium but it is 30 feet above them and there’s no way out. Bob calls the Doctor again and tells him the Angels will be there soon and also the reason the Angels wanted him to communicate that much. This was to let the Doctor know that he has let Bob down and even though he promised him his fear would help him stay alive, he died in pain and alone. There’s something the Angels are very keen you should know before the end. I died in fear.You told me my fear would keep me alive but I died afraid, in pain and alone.You made me trust you, and when it mattered, you let me down. I’m sorry, sir. The Angels were very keen for you to know that. The Doctor, extremely angered by the Angels mocking his value for life like that, says the Angels did their second big mistake. He then asks everyone if they trust him (To which River replies Always and I am now 100% sure she’s blackmailed and not a villain). When everyone says they trust the Doctor, he say that he’s about to do something very very stupid and dangerous and when he does they should all jump as high as they can. He then declares that if someone values their existence and want to build a successful trap there’s one thing they should never put in it. That is of course the Doctor himself, who takes the Bishop’s gun and shoots the gravity globe that held the light hovering above them. And that’s it. The credits roll and I’m left with my mouth hanging open, having forgotten this is a two parter and that I don’t have the fraking DVD like I did when I watched the previous seasons! Damn damn damn! All in all, I love the episode, it moved pretty fast and if possible left more questions about River. I love this woman, she has style, she’s cheeky and she knows the Doctor’s real name 😮 I am a sucker for romance so I really hope River is a love interest of the Doctor’s. The only thing I can do is brood and wait for the next episode and probably produce some fanart while waiting. If I find my wacom stylus -.- I wanted to write more but it’s 3 am, it’s a working day tomorrow and I’ll have to wake up when my son does so Goodnight from me but it is Picspam time for you so fasten your seatbelts.